Anna Ancher is the face of A World Apart, but hers is not the only visage gracing canvases. The Skagen artists painted the local townspeople but also modeled for each other’s works. These portraits provide glimpses into artists’ interrelationships within the colony. 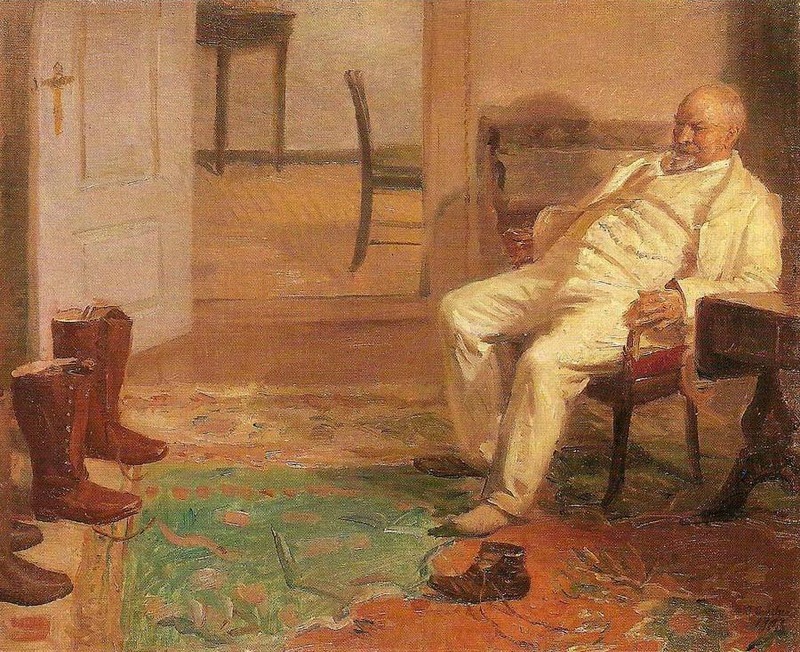 Anna Ancher used her husband Michael Ancher as the subject of several of works set inside their home, depicting him dining in Breakfast before the hunt, painting in Michael Ancher before an easel, and deliberating between shoe options in The new hunting boots. The latter provides a humorous narrative, poking fun at Michael’s indecisiveness over a trivial matter while emphasizing his paunchy belly. Anna’s unflattering depiction of her husband is harmless and signifies the couple’s easy relationship. In Michael’s Anna Ancher returning from the field, the Skagen native wears a loose-fitting dress and straw hat. Michael portrayed her as active and content while confidently meeting the viewer’s gaze. The sunny composition exemplifies Michael’s talents and reflects his warm relationship with his wife. In contrast, P.S. Krøyer’s Summer Evening in Skagen depicts a melancholy woman—the artist’s wife, Marie Krøyer. Elegant but reserved, she is shown turned from the viewer. Her fashionable dress pops against the blue expanse behind her. Perhaps Krøyer’s rendering of Marie’s wistful beauty alludes to their troubled relationship. The tightly-knit artists portrayed each other as artistic and societal equals—or rivals. 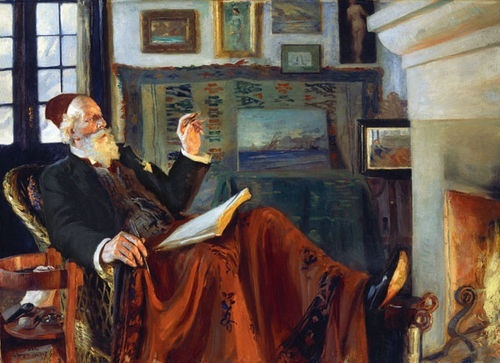 In By the fireside (Portrait of Holger Drachmann with a red fez), Krøyer depicts his fellow artist with polish and pomp. Rendered with all the trappings of a distinguished individual, Drachmann sports shiny shoes and an eccentric red fez. Framed art clutters the walls of his comfortable room, and various pipes lay scattered on a side table. Drachmann’s lack of compassion for Krøyer’s afflictions may be due, in part, to his resentment of Krøyer’s reputation as the most famous talent of the colony. 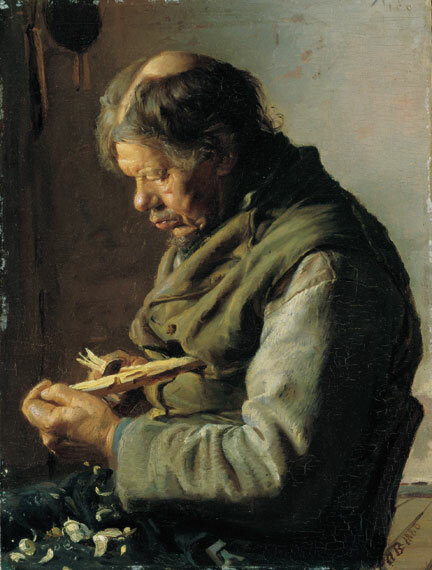 In contrast to the artists’ grand depictions of one another, the show also features small portraits of rustic townspeople, including Anna Ancher’s unidealized portrayal of a fisherman in Old man whittling sticks. With serious faces against stark backgrounds, they are shown in a “no frills” manner. Conversely, Skagen painters also elevated fishermen as heroic subjects for braving the formidable seas. 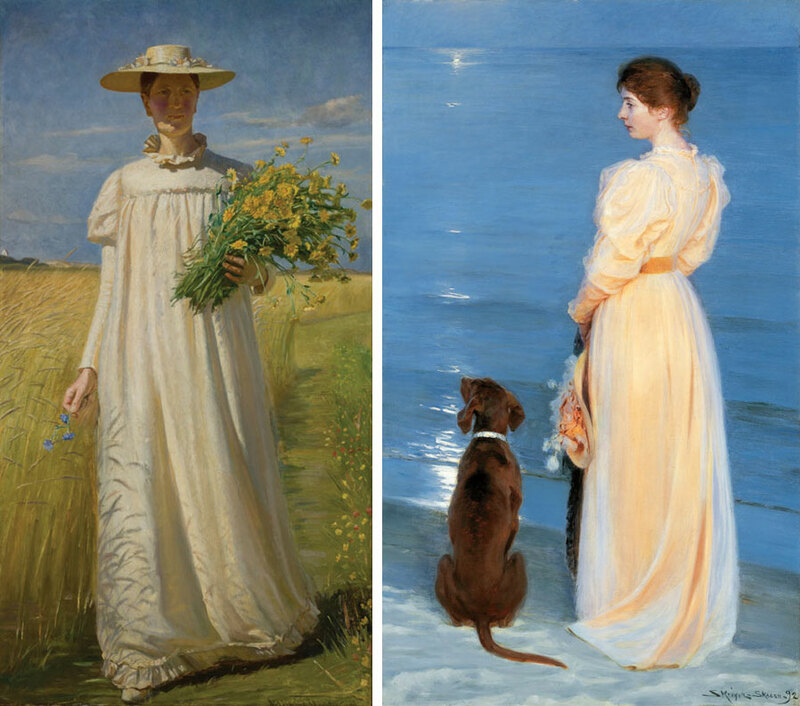 Connecting faces with names, A World Apart offers visitors the rare opportunity to understand the works of these Skagen painters, both as artists and as models. 1. Svanholm, L. (2004). Northern Light: The Skagen Painters. Denmark: Gyldendal, p. 184.